The final step of the 10 Steps to Freedom series shows you how to make the best of your talents both to ensure your financial independence in the long term and to serve humanity. You’ve reached the end of one the most exciting and important milestones of your life. You are financially independent! This means you are earning enough money from your home-based online business to can easily afford all the expenses of a normal life with, hopefully, some extra money to afford a great vacation, a new LCD TV, or even a more comfortable and safer car. Your goal now is is to balance the freedom that your e-business success provides you with while still growing your online assets to ensure financial independence in the long term. While it’s highly unlikely that the whole Internet will crash one day, it is possible that your site could be delisted or penalized by accident, even if you never break any of Google’s webmaster guidelines. This is why you need to diversify your income streams. In case one income dries up for any reason, you’ll have others to back it up. You don’t want to make 7 travel websites that all depend on the same topic. Although people will always want to travel and the demand will grow in the future, your online empire will always rely on the same type of business. The recent US mortgage crisis revealed that even massive and profitable markets like mortgages and housing loans are not always stable. Your goal, then, should be to create different types of websites, like product reviews, travel, home related (improvement, cleaning, decorating, …), pet related (always in huge demand), and so on. By doing this, your income will come from different types of visitors. It is highly unlikely that they would all be affected by the swings in the global economy. Diverse monetization types will follow automatically if you follow the first step of creating different websites. Even if your websites are all product review related, you can still monetize them with Google Adsense, Chitika, Amazon, Shopping, eBay and other types of affiliate links. Online spending grows year after year, so you should never worry about a lack of demand. It is still possible to be banned from Google Adsense, though, so if your whole online business model is based on Adsense, you run the risk of having a financial and mental breakdown, should your Adsense income suddenly disappear. Your best bet is to sell your own digital products, create website earnings from contextual advertising networks like Adsense and Chitika, and build websites that focus on lead generation and affiliate marketing. If you really want to be financially independent and free from worries about the future, imagine losing 50% of your income tomorrow and then determine whether you would still be able to enjoy financial freedom based on your online business. Even though offline businesses typically create a lot of work, such as manufacturing, shipping products and customer support, there are ways to build offline businesses based on passive income. One example is a small internet room where you rent internet connections for a fee based on the time spent online. You only need to hire someone to collect the cash and make sure everything runs smoothly. The key to success with this idea, of course, is demand and choosing a great location. While in the online world everything revolves around information, in the offline world the key to success is location. Let’s say you’ve done all of the above and you now enjoy a constant stream of passive income with almost no work from your side. This is one of the most complex life questions faced by everyone who is financially independent. In my opinion, the purpose of life is to enjoy the ride while it lasts, learn life lessons that create better a character, and serve other people with the talents and skills you have developed in your journey so far. I also think that money is only one third of what makes us happy. Once the money problem is taken care of, you need to balance the egoistic desire to please yourself (which will always exist) with your purpose of serving and helping other people with your talents. Your goal after becoming financially independent should be to help solve challenges that other people face. 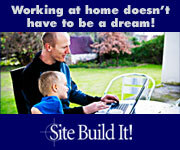 I have, at present, two main income streams that earn me almost $10,000 per month. I sell ebooks and videos on my passion website, TennisMindGame.com, and I have created a few product review based websites that earn money through Adsense, Chitika and affiliate programs. My goal is to create at least 5 to 10 large content websites that will depend on free search engine traffic and convert it into sales and clicks on PPC ads. I’m already working on a new set of tennis videos for advanced players and plan to create 3 DVD’s on tennis tactics next year, in collaboration with another tennis coach and good friend. Since tennis is my area of expertise, I will very likely stay in this field and focus more on the mental side of the game, where I have good skills and talents, to help other tennis players overcome their mental barriers. Another topic about which I feel passionate is financial freedom and independence. I plan to share my ideas on this blog and, eventually, may do some coaching or even create an ebook or a training program to help others. Another topic that I need to look into is the stock market. I plan, at the least, to start investing in mutual funds. Thank you for reading this »10 Steps to Freedom« series. I am 100% confident that you can achieve financial independence by following the steps I have outlined here. But there is a catch, I do not want to put my name on the web with the theme anxiety attakcs, since everybody would know to associate me with that and it could turn up to be a problem in real life. So my question is, is it possible and worth it to do the web site with a description of myself and no name, or just a letter symbolizing my name… I am just thinking about the credibility, that how important it is for a site to have a very open author. Based on my experience with different types of websites, I think your name and who you really are is important if you sell your own products through your site. You need credibility and it’s easier to establish relationships with other webmasters with whom you need to cooperate, exchange links, promote each other’s products, etc. But if you just want to put up an informative site and earn through advertising or affiliate marketing, then your name is not important. People are interested in buying products and quickly click on an ad or you send them to a trustworthy online store like Amazon.com where they don’t hesitate to buy. I suggest you try http://www.getafreelancer.com where you can find lots of writers that are willing to work for low price. You’re welcome, Elena. All the best with your SBI adventure. I just read through this series of articles. Fantastic and very inspiring! Thank you. I have been feeling very discouraged about my 5 year old site lately and was debating about selling it and starting over. Reading through this series has inspired me to make my own products once and for all and then rearrange my site to monetize these products. I’m also going to bite the bullet and delete Adsense from 90% of my site. My income went from a high of $250/ month to barely touching $100/ month. I’m taking that as a message to monetize more intelligently. Thanks for giving back through this fab site. I know that many people appreciate your knowledge and generosity. Thanks a lot, Amelia. Adsense is ok while it’s ok. 😉 It can still earn a lot in the right niche. But in the long term, becoming more independent with your own products is the key to sustainable business.